More dirty tricks from government over welfare reform? 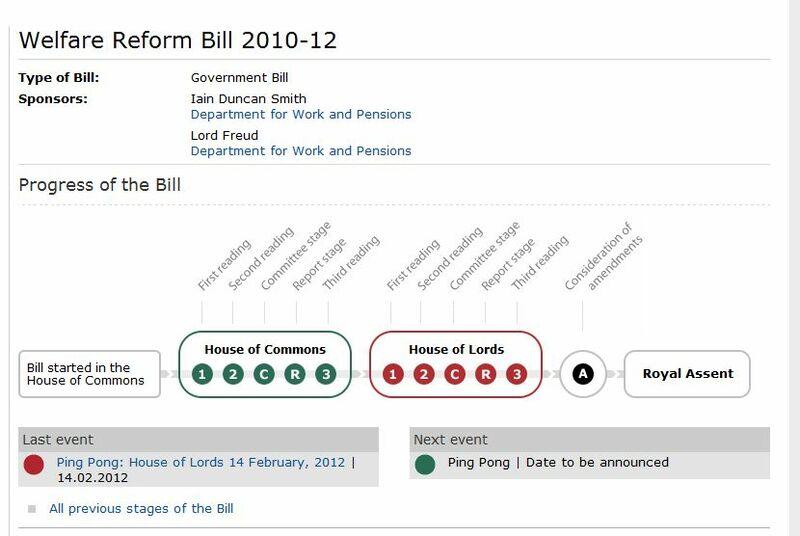 The welfare reform bill is back in the House of Commons after 14:30 today as part of “ping-pong” between the Commons and the Lords, but you wouldn’t know it if you relied on the usual methods of finding out. The last event for this bill was debate in the House of Lords on the 14th and I have been checking the Parliament website and waiting for an email to inform me of the next event for the bill, to no avail. 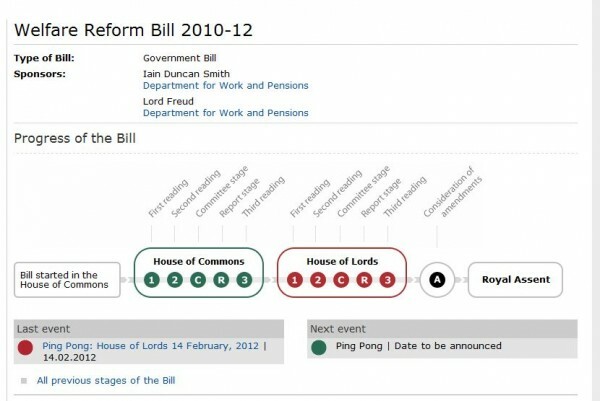 Until this morning the order of business for the House of Commons simply said “Consideration of Lords amendments if necessary” and until a few minutes ago the official Welfare Reform Bill web page still said that the next event was “To be announced”. The order of business for today and the official website have finally been updated with very short notice for the debate. This matters because MPs don’t always attend debates – they have many other things to do in their offices and their constituencies or elsewhere. An email has finally arrived in my inbox to inform me of this update. It carries a timestamp of 7:56 but it only turned up in the last half hour. We have to ask why the announcement of this has been delayed until the day itself. Is this normal behaviour for Parliament? Or perhaps this is an effort to bury the bill in an effort to prevent MPs who plan to rebel from turning up? With the government also having taken measures to limit the debate today to one single hour in total and with Lord Freud having previously re-amended the Lord’s amendments late at night after peers had gone home, my money is on the latter. This list will be updated through the day. Please send me any links to relevant radio and TV that I haven’t got. Twitter @latentexistence or email latentexistence at gmail.com. The House of Lords will meet from 2:30pm today and you can view it on the Parliament TV website. Home Affair editor Mark Easton outlines the history of the allowance. And Minister for Disabled People Maria Miller and Lord Colin Low, president of the Disability Alliance, debate opposition to proposed changes. The Victoria Derbyshire show on Radio 5 discussing the Welfare Reform Bill on the 17th January 2012. With Baroness Tanni Grey-Thompson, Kaliya Frankilin, Louise Bolotin, Jane Young and Minster for disabled people, Maria Miller. Print media and web links are listed at all big ideas start small. The piece below was written for the Pod Delusion podcast. You can listen starting at 9:36. You can download an MP3 or subscribe on the Pod Delusion website. This is the full text of my report. On Monday a report on the welfare reform bill was released, put together under the leadership of Sue Marsh and Kaliya Franklin of The Broken of Britain, and with support from countless sick and disabled people. It has already received support from such names as John Prescott, Caroline Lucas, John McDonnell, Stephen Fry and Tim Minchin. The report, titled Responsible Reform and referred to on the internet as the Spartacus Report, used a freedom of information request to obtain some five hundred responses made to the government consultation on the reform of Disability Living Allowance. The report is unique in that it was entirely researched, written and funded by disabled people. Funds to enable this report to be produced and to be printed and delivered to MPs and peers were raised through donations from sick and disabled people contacted through social media. They raised more than three thousand pounds. Volunteers were found to contact their MPs to discuss the report, and thousands more helped to promote the report on social media and in the physical world. Press releases were sent out and the authors of the report talked to journalists. Before I tell you what the report found I would like to first tell you what this cost some of the people involved. I read and recorded the data for the Spartacus report on my daybed. I wrote the first half of my section of the Spartacus report on my daybed. I became more and more sick as I wrote it and by that stage became virtually unable to leave my bedroom. My painkillers were now at maximum dose. I wrote the third quarter of my section of the Spartacus report from my bed. By this stage I was only able to work for a quarter of an hour at a time and then had to sleep for the rest of the hour. I wrote the rest of my section of the Spartacus report in bed as and when I could, working through the night as the pain now meant I couldn’t sleep anyway. I no longer left my bedroom. After sending the report to Sue I spent 5 whole days in bed, only leaving it to drag myself to the loo. I only started to sleep again on day 3 when the pain started to abate. When the spartacus campaign was launched I tweeted, emailed and facebooked from my daybed. By early evening (6pm) I had to retire to my bedroom. On day 2 I was bedbound and unable to leave my bedroom. I tweeted etc from my bed. Painkillers once again to max. Today, still confined to bed. I pushed myself to the absolute limits and each time I did, I had to go to bed or be threatened with hospital. I did the first two weeks of #spartacusreport from bed, barely able to get myself a drink. Then, when I realised what I’d taken on, I gave my life to it. I worked from 6am til midnight, I didn’t wash any clothes or play with my children for 6 weeks, I didn’t cook, I didn’t appeal my DLA decision, I didn’t sort my housing benefit out, I didn’t go out, I didn’t do anything but work on #sartacusreport. Immense thank yous to my Mum, Husband and children for making it even vaguely possible. I had three chest infection, a crohn’s flare a fractured rib, two atrial fibrillations and I didn’t even tell anyone about the last thing cos I knew they’d make me stop. By the end of the second day of pushing this report several of the people involved were so ill that they were hospitalised. Kaliya Franklin recorded a video in which she told us about these events but she was unable to speak above a whisper and was very close to hospitalisation herself. So now you know just what went into this report, but what did the report actually find? The report found that the vast majority of responses to the consultation were against the introduction of Personal Independence Payments to replace DLA. While most people accept that some reform of Disability Living Allowance is necessary, there is widespread agreement in the responses that Personal Independence Payments are not it. Of the five hundred responses to the consultation, 74% were against the proposals for PIP, and 19% had serious reservations. A mere 7% supported the proposals. This story was unexpected enough that it made it into the Guardian, the Telegraph, the Mirror, and even the Daily Mail. So the first find is that despite government claims to the contrary, the consultation was overwhelmingly against the proposed reforms. This hasn’t stopped the government continuing to claim support. The second important find is that the consultation, which was two weeks shorter than required by the governments own code of practice and took place over the Christmas break for good measure, ended two days AFTER the welfare reform bill was written and presented to parliament. The bill clearly could not have been written based on evidence submitted during the consultation even if it were written by hummingbirds on speed. This is not the only problem with the behaviour of the government. They have consistently claimed that there has been a 30% rise in claims for DLA, but it is actually 13%. The government has even admitted that this figure is “distorted” but continues to claim 30% which is the figure that MPs and peers have been told and have used in Parliamentary debates. The government has failed to note that much of the 13% rise in claims for DLA is due to an increase in diagnosis of mental health problems and learning disabilities. This is likely to reflect improved health care rather than nefarious claims for DLA. The report notes that DLA is not an out of work benefit but is a cost-saving benefit. DLA is paid to cover some of the extra costs incurred when living with an illness or disability, and is paid regardless of income. By covering those costs DLA allows independence and freedom to people which they would not otherwise have, and if taken from them would cause them to fall back on other health care and welfare services instead. Many people are able to work only because DLA provides them with the ability to travel or make expensive adaptions, and without DLA will be forced to claim other benefits instead. As such DLA actually saves money by preventing the need for much greater expenditure elsewhere. One expectation of the welfare reform bill is a 20% cut in the budget for welfare costs. One of the ways in which they intend to accomplish this is that the new personal independence payments would introduce frequent testing much like the work capability assessment used for Employment and Support Allowance. The report notes that this testing is pointless in a great many cases where disability is permanent and may be degenerative, which given how hard it is to get DLA, is a lot of cases. It seems to me that the purpose of introducing such tests is to pander to tabloids and their readers rather than common sense. The policy defies logic enough that in April last year Ollie Flitcroft, a Conservative councillor for Barrow Borough Council and himself a wheelchair user, resigned in protest. Even the Daily Mail has featured an article favourable to the spartacus report. There were several other important point in the report but I will leave these for you to read for yourself. The link to the report is at the end of this article. Since the release of the spartacus report and all of the campaigning that has gone with it, the debate of the welfare reform bill has resumed in the house of lords. Having already been through detailed examination at the committee stage but having most amendments blocked by conservative peers, the bill is now the subject of a flurry of amendments at the report stage through January. On Wednesday heated debate in the Lords surrounded amendments to the government’s key policies on Employment and Support Allowance. Lord Patel and Lady Meacher argued the case for their amendments from a very strong position which Lord Freud was unable to counter. In an embarassing turn for the government, three amendments were passed by substantial majorities which overturned plans to time-limit contribution based ESA to one year, exempted cancer patients from time limits all together, and restored access to ESA for children with severe disabilities so that they would be ensured the support that they need in the future. Despite this defeat, which is perhaps the largest defeat for the government since the election, this fight is by no means over. The report stage continues in the house of Lords through January, and after the third reading it must return to the house of commons for approval of the amendments. I still believe that the whole bill is flawed, and I and countless other disabled people call for the welfare reform bill to be put on hold and reconsidered in light of proper evidence. The Daily Show responds to censorship of TV comedy about Parliament. Are we allowed to watch this? I don’t know, but if we aren’t, screw you censorship.